...but this is better. The rum syrup makes this cake. This is an excerpt from Dorie Greenspan's cookbook: "Baking - From My Home to Yours." She is my baking hero. Make sure you pick up a copy. The texture of this cake is perfect. The crumb so soft, that you could mistake it for a Sara Lee pound cake. But what you get here is a flavor that Sara Lee can never deliver, one that depends on using the very best vanilla you can find. The first choice is a pair of moist, pliable vanilla beans. You get the truest flavor from beans and if you follow the trick of rubbing the pulp of the beans into the sugar; you'll get tremendous results. If you use extract, you'll still get an excellent cake, but you've got to use pure extract (or make your own - see vanilla extract link below). Your family and friends will beg you for this vanilla pound cake recipe. PREHEAT oven to 350 degrees. Butter two loaf pans (even is they are non-stick) and dust the insides with flour; tap to remove excess. Place the pans on an insulated baking sheet or on two regular sheets stacked one on top of the other. Sift the flour, baking powder and salt together; set aside. Put the sugar and the pulp from the vanilla beans in a large mixing bowl and rub them together with your fingers until the sugar is moist and fragrantly infused with vanilla. If you are using pure vanilla extract, it is added later. Add the eggs and whisk them into the sugar and beat until they are incorporated. Add the vanilla extract (if you are using it) and then the cream, followed by the rum. Continue to whisk or switch to a large rubber spatula and gently stir in the dry ingredients, divided into 3 additions. The batter will be smooth and thick. Fold in the melted butter divided in thirds and then pour into the prepared pans; smoothing the tops with a rubber spatula. Bake for 55-60 minutes, or until a knife inserted into the center comes out clean. (As soon as the cakes go into the oven, make the syrup.) After 30 minutes in the oven, check the cakes for color - if they are browning too quickly, cover them lightly with foil tents. The vanilla pound cake recipe includes a rum syrup (that I think makes this cake); try it. Meanwhile, to make the syrup you stir the water and the sugar together in a medium saucepan over medium heat until the sugar melts and then bring to a boil. Remove from the heat and stir in the rum. When the cakes are done, transfer them to a wire rack to cool for 5 minutes before unmolding them and turning them right-side-up on the rack. Place the rack over a baking sheet lined with wax paper and using a thin skewer or knife, poke holes all over the cakes. Brush the cakes all over with the rum syrup, wor4king slowly so the at the cake sops it up. Leave cakes on the rack to cool to room temperature. Use only 1/2 of the vanilla bean or 1-1/2 tsp pure vanilla extract. Rub the grated zest of two lemons into the sugar. In addition, you can add 2 thick strips of lemon zest to the pan when you heat the water and sugar for the syrup. You can replace all or part of the rum in the syrup with lemon juice - if you want additional tartness. Follow the changes for the Lemon Loaf Cake, but rub the zest of 1 large orange into the sugar. 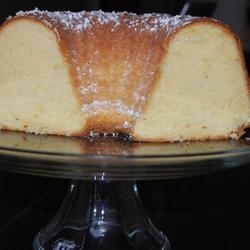 If you want a cake with a purer orange flavor, substitute 2 tablespoons of Grand Marnier for the rum in the cake batter or, (with or without the rum) add 1/2 teaspoon of pure orange extract or 1/8 teaspoon orange oil to the batter. Very finely cut up bits of a moist stem of ginger in the syrup (found in Asian markets and the specialty foods section of many supermarkets) which is a hot-sweet addition to the vanilla, lemon or orange loaf cakes. Stir 3-4 tablespoons (depending on your taste) of the ginger bits into the batter before pouring it into the pans and baking. For a fully gingered cake, whisk 1 tablespoon of ground ginger into the dry ingredients. Serve this loaf without the syrup soak or brush the warm loaf lightly with some of the syrup form the preserved ginger.